OCZ has a new SSD that's both faster and slower than the previous model. That's what can happen when you swap controllers on an SSD. A year ago the hustling and bustling SSD supplier introduced its Vertex 3 with a bought-in SandForce SF-2281 controller inside. Since then LSI has bought SandForce and OCZ has bought its own controller company: Indilinx. That company's Everest 2 controller, using two ARM chips, is what drives the new Vertex 4 SSD. The Vertex 4 comes in 128GB, 256GB and 512GB versions. It has a five-year warranty compared to the preceding Vertex 3's three-year warranty stretch. 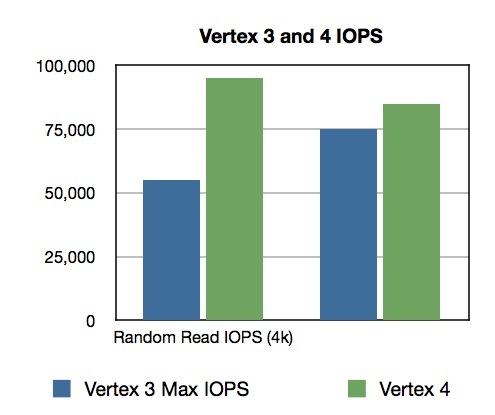 Vertex 4 is faster than Vertex 3, particularly with regard to random reads. 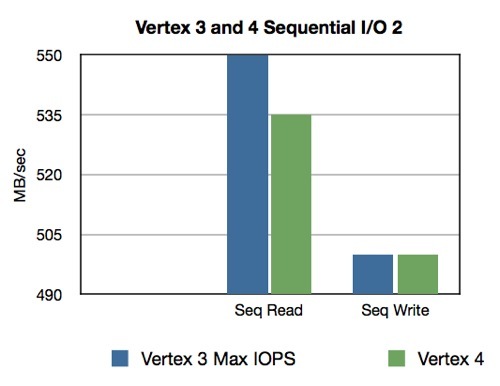 But Vertex 4 is not faster than Vertex 3 bandwidth-wise; in fact it is quite a bit slower at sequential reading. It appears that OCZ has optimised the thing for random I/O and been unable to get sequential I/O up to Vertex 3 levels, which is a pity. OCZ fleshes the differences out in Vertex 4's favour, saying that its latency is "as low as 0.04ms for read operations and 0.02ms for write operations, delivering an improvement of approximately 80 per cent over the Vertex 3". The SSD-maker then claims that "[i]n typical use case scenarios, the Vertex 4 outperforms the Vertex 3 by as much as 400 per cent." All in all though, these are pretty decent I/O numbers and we might look forward to a go-faster Vertex 4 Max IOPS edition. The controller does the usual wear-levelling, garbage collection, error correction and so on, which enables OCZ to offer its five-year warranty. OCZ does not say anything about performance consistency over time, although it does assert: "[Vertex 4] consistently accomplishes superior real world performance over the long term regardless of whether the data streams are in compressed or uncompressed formats." The company is expanding its SSD product range energetically and introducing new products and refreshing existing ones at an incredible rate. The chances are that it will be a survivor in the almost inevitable flash drive supplier shakeout that's coming along in a few years' time. We see two blots on its escutcheon. Firstly, there appear to be support issues with consumers saying they get faulty drives which are fixed slowly or not at all – and that refunds are tricky to get. Secondly the drives can feature fresh-out-of-the-box performance that may tail off. If OCZ can get product quality and support issues resolved, and provide consistent drive performance over the long term, then there's probably no stopping the outfit.